Sit Happens is Missoula's only dog training facility with all instructors certified by The Certification Council for Professional Dog Trainers (CCPDT). Our staff specializes in companion manners training, dog sport classes as well as behavioral modification for reactive dogs. Our trainers know that our canine companions are as complex as we are-- that's why we pride ourselves on small class sizes in a safe, friendly, and fun environment. We are eager to assist owners at any experience level, whether you are a first time dog owner or a seasoned vet! "Thank you SIT Happens for the training class! We brought our 11 month old Shiba Inu Yuki in to get her to focus a bit more and to start her on a track of better manners. After 6 weeks I am happy to say she is definitely doing better. There will always be things we need to reinforce with her, but I feel like she is much more aware and attentive than she was when she started." "I was having all kinds of trouble with my dog. He was barking, chewing on everything, and in general being a big trouble maker. I searched around for some training classes and settled on Sit Happens. I am glad I did not go with the box store training but instead went to someone with years of experience. After just a few classes he seemed to be developing self confidence and his home behavior started to improve. After implementing their advice, Marvel is doing waaaaay better. Thanks Sit Happens for helping me turn my Marvel from a super villain to a super hero!" "So grateful for the guidance, knowledge, and compassion we have found with SIT Happens. Awesome name aside, they have been our trusted resource as we have navigated puppyhood with our Llewellin Setter. Whether it has been socialization, doggy daycare, training classes, or a reassuring voice on the other end of the line, they have never let us down. Thank you, Sarah. You've made a world of difference for us. Very grateful for you." 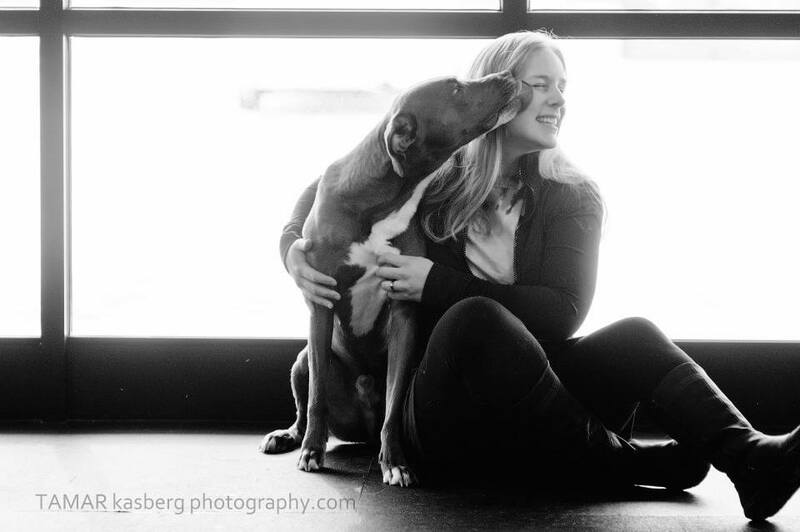 I feel so lucky to have found people who are truly knowledgeable, always learning, and focused on creating positive, loving relationships between dogs and their owners. Another trainer might have tried to convince me to use more forceful techniques with my reactive Great Dane, but they have worked to teach me how to work with him rather than just work him. They've also helped me train an agility dog that will be going for his first title ever soon. I recommend them to everyone. Totally trustworthy and they care about your dog's well being first and foremost. A million stars." "I am not sure if there is a class I haven't taken at Sit-H. Love the place! Sarah is a great trainer and always keeps classes fun. It is so nice to have an indoor facility for fun classes especially in the non-summer months." "We've been coming to Sit Happens since before we even brought our first dog home. Through the years we've gotten so much great advice and support, and we've made a lot of friends going to classes and playtimes. We don't know what we would do without them."